According to one historian cited, the Bush administration has been "the most reckless, dangerous, irresponsible, mendacious, arrogant, self-righteous, incompetent, and deeply corrupt one in all of American history." Cow wonders if the only explanation could be a Man Crush ...While Bush isn't attractive to Cow, apparently some other leader's actions can only be explained by Man Crush luuuuuuve. 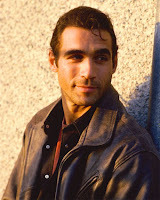 Speaking of which, that's Adrian Paul...no relation to this blog. Unfortunately. Like the Harding administration with none of the redeeming features. He scares us over here! He scares us over here too.